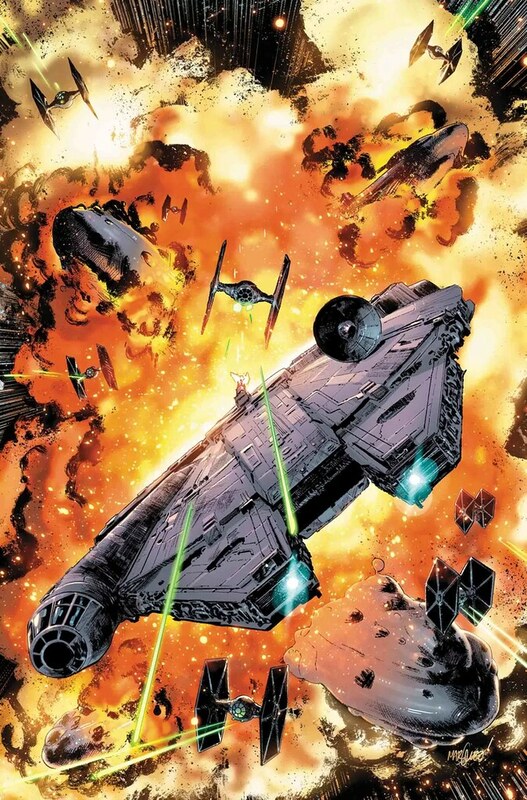 Star Wars #51 picks up on a storyline in Star Wars I never thought about. Toward the end of A New Hope, Han shows up, shoots Darth Vader’s TIE fighter, and thwarts the Dark Lord’s defense of the Death Star. That had to have been a humiliating defeat. Not too mention Han goes around saying what a great pilot he is. It’s only natural that Vader would carry a grudge and want to show that he is the better pilot. Not to mention he’d want to settle the score. The issue opens with Leia and company boarding Queen Trios’ ship and trying to capture her so they can get the override codes for their fleet. Interestingly enough, that doesn’t go to plan and Trios escapes. The Rebels do figure out a way to open the bay doors for their ships, but it requires another Rebel ship to fly at the hangar door. Thus cue Han Solo. However, Han’s arrival gets Darth Vader’s interest, and he goes out to personally deal with this Rebel nuisance. It’s a good story, but the rivalry between Vader and Han gives it an extra edge that I really got a kick out of. It’s a match up I never gave much thought to until now. In the films, there’s never any inclination of personal animosity toward Han from Vader. But think about it, there has to be. Vader is an emotional guy. And not only does Han shoot him down, which gets the Death Star blown up, but he escapes him after Hoth. No wonder he freezes him in carbonite. I can’t wait to see where this goes next as it seems like Vader is having a field day. Everything is going in his favor. The Rebel fleet is being decimated. He has the complete upper hand. And now he has a chance to get revenge against the Millennium Falcon and Solo. We know he can’t win completely, but the question is just how successful will he be? For pulling up a story point I had missed from the films and making the most of it, coupled with some good artwork, I give Star Wars #51 a five out of five metal bikinis.